Summer activities hold lots of walking: strolling the boardwalk, carnivals, fairs, antiquing, summer concerts, art exhibits, sightseeing walking tours, to name a few. Want a stylish but supportive summer sandal for when your playtime means hours on your feet? 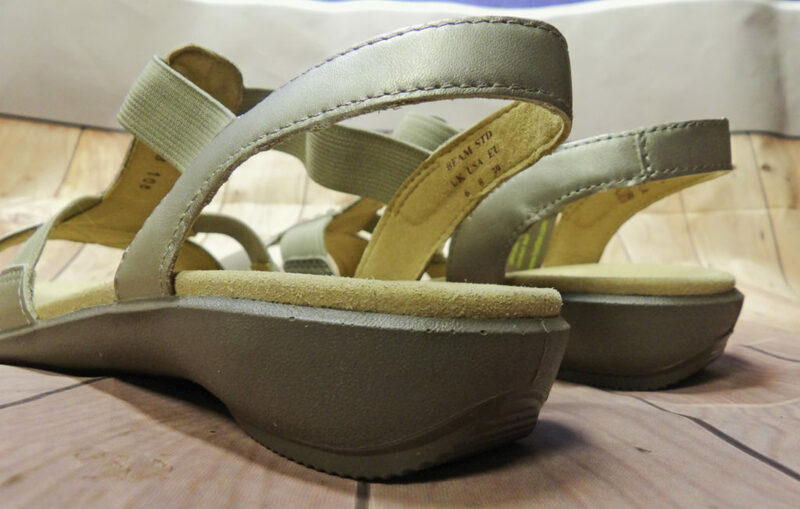 We like the Beam Summer Sandal by Hotter Casual Concepts. Ideal for vacations that have consecutive days that you are on your feet, or for running errands around town, the Beam Summer Sandal is a feminine but comfortable summer flat sandal that provides insole support. It is a slip-on style that is suitable for day and evening wear and is versatile with jeans, shorts, a pantsuit, sundresses, and casual evening wear such as to pair with a flowing skirt or capris for dinner at a restaurant or at an alfresco dining party at a friend’s house. 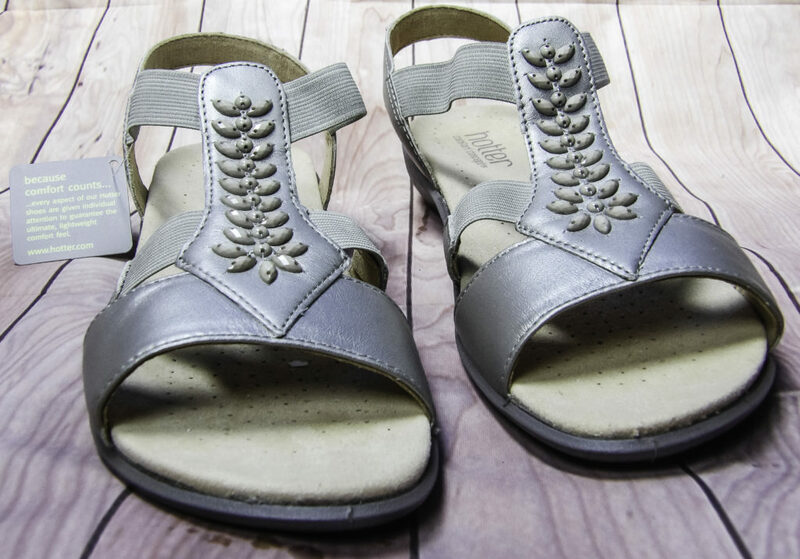 If you are familiar with Hotter Casual Concepts, the Beam sandal is a new and improved version of their Montserrat sandal model. The Beam has soft micro fibre insoles and lightweight, flexible soles. 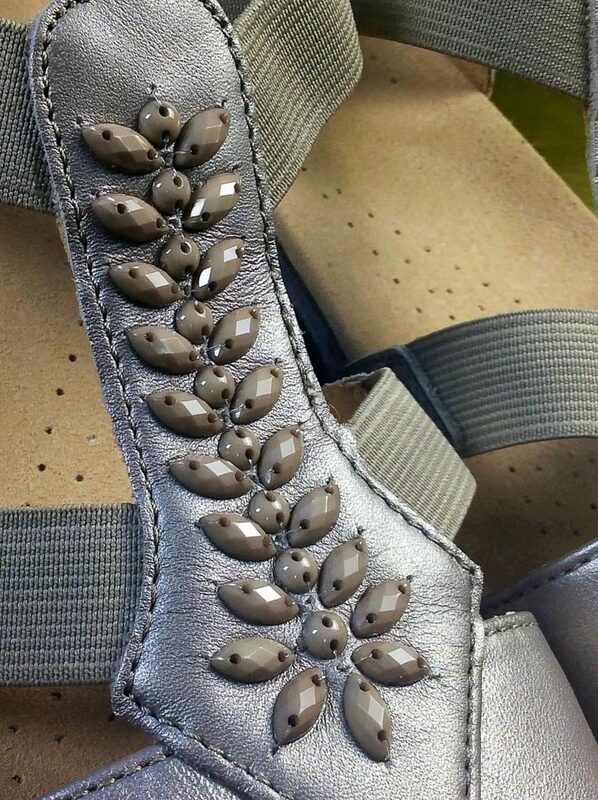 The straps are leather and they are lined so as to avoid irritating the heel or causing blisters. Cushioned sling strap for comfort and no blisters! 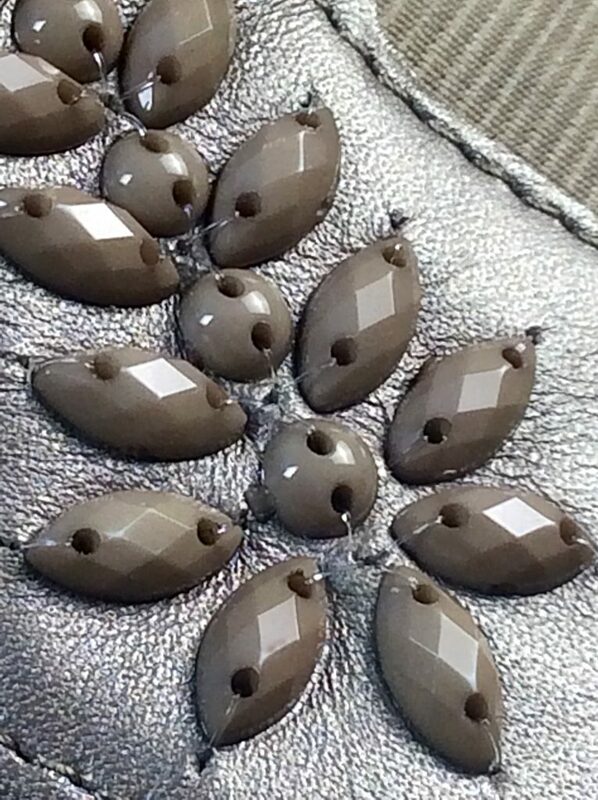 There is beveled beading decorating the full length of the T-bar on top of the sandal. The bevel catches the light and provides some visual interest but it is subtle, so it would still be appropriate in a work setting. The Beam Sandal comes in four versatile colors: Black, Tango Red, Aquamarine and Nickel Metallic. The Aquamarine, Black, and Tango Red are Nubuck leather, and the Nickel Metallic is leather. We chose the Nickel Metallic color because it goes with so many colors and styles and it adds some understated sparkle to more conservative pants for a more dressy but relaxed look. The heel height is 30 mm or 1 1/4 inch high. Just enough to give some lift and support without tiring out the arch. 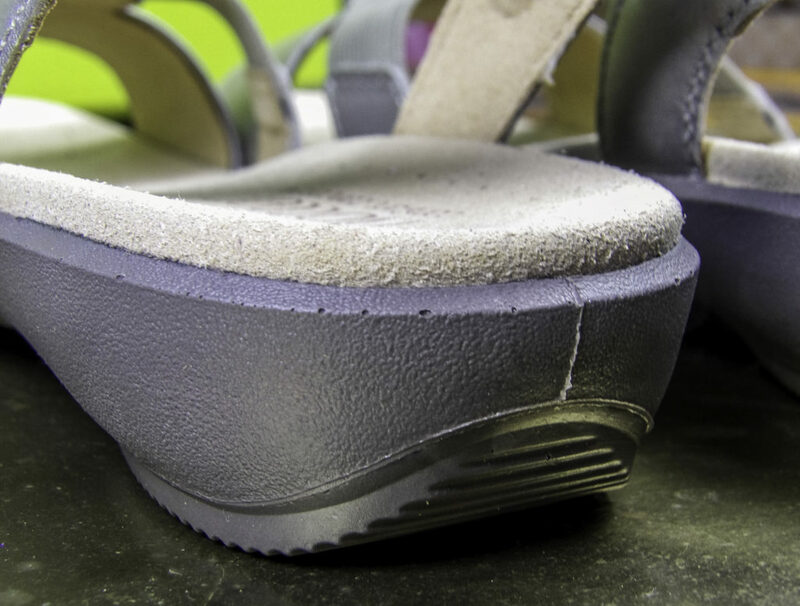 There are four elasticated front straps that offer lots of give and flexibility when walking. The intent is so toes have space to wiggle and flex when walking or standing so that feet are not as tired or stiff after extended walking or standing. It has a cushioned and contoured insole made of a soft microfiber material. They are soft and comfortable, wear well and provide support without being too rigid. The feel is similar to a very expensive pair of shockproof shoes. 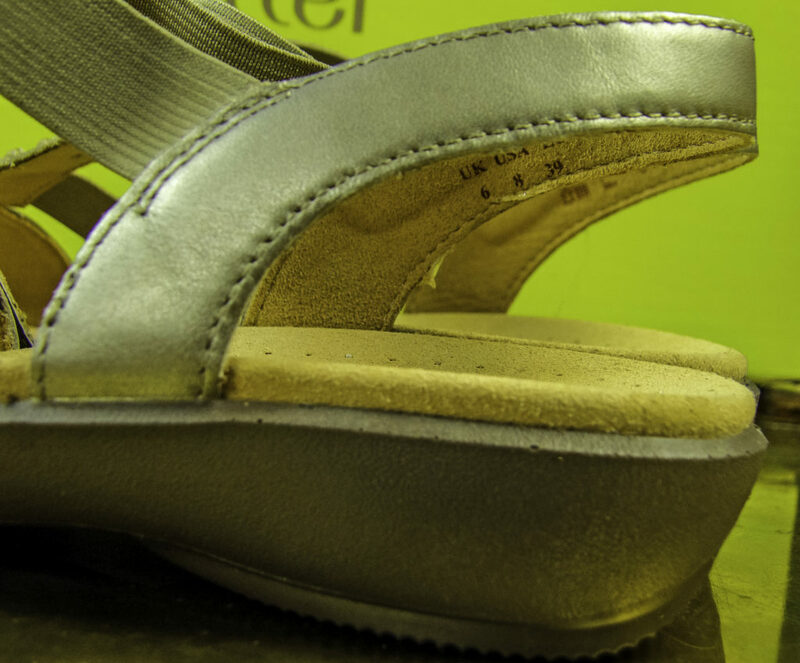 The sole heel also has some traction treading similar to a driving shoe. 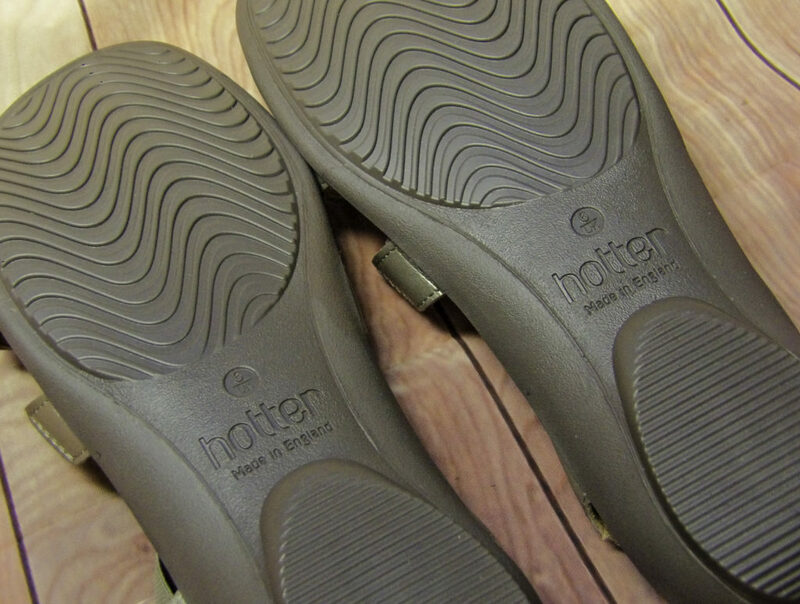 The soles are sturdy and have skid-proof traction for better grip and ease when walking, including in the garden or on unstable stone walkways. I wore them all day for a day of errands, shopping, and going to lunch. 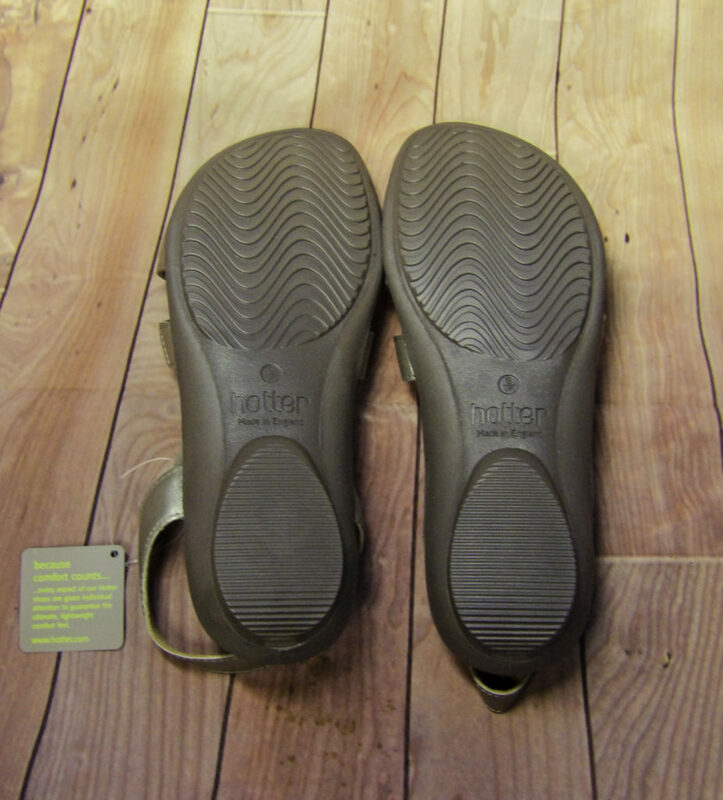 My feet were comfortable and cushioned while walking, and felt supported like an anti-shock shoe even on stone stairs, uneven walkways, and hard floors. They are comfortable to wear while driving and the heel tread keeps me from scuffing the sandals so they stay in good condition. My feet did not feel restricted during the day and they were not sore at night despite walking and being on my feet all day. 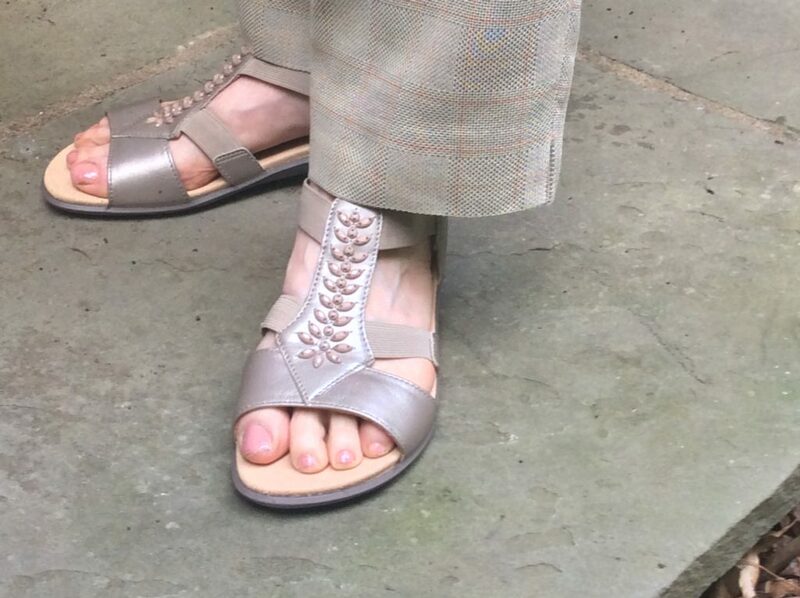 Wearing the Beam Sandals for a day of errands, shopping and a luncheon held in a friend’s cottage garden, lots of standing around on a hard slate and stone patio after a morning full of walking! Comfortable and stylish even after standing and walking all day! 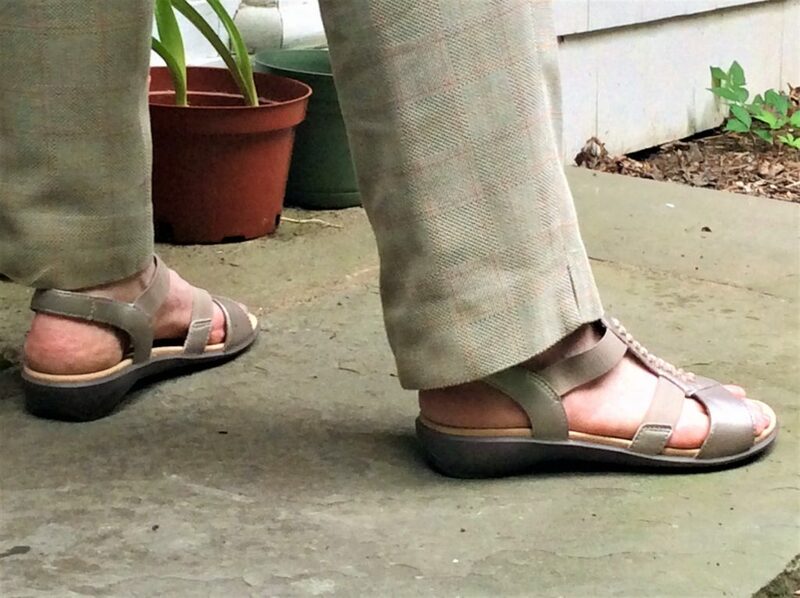 Hotter Casual Concepts designs shoes and sandals that are stylish, durable and comfortable and most importantly provide support and cushioning for feet so they can be worn all day and still look and feel good. Attractive and feminine but with the features of a durable, functional anti-shock shoe with slip-proof detailing and driving shoe grip, the Beam sandals by Hotter Casual Concepts are a versatile go-to summer sandal ideal for vacations, weekend getaways, casual but well-dressed parties, work functions, or just for running errands. Get 40% off and free shipping on your first order offer – code PRUS17. This offer is valid on first orders only and orders over $40. Free shipping applies to standard US delivery only, regardless of the number of items ordered. Offer ends 30/12/2017.This offer is conditional upon purchasing full priced footwear and purse(s).The offer code must be quoted at the time of placing the order and cannot be applied retrospectively or used in conjunction with any other offer unless this has been specified separately. Only one offer per transaction can be used. Shoe care products and discounted products (including sale/clearance/last chance items) are excluded from promotional offers. Hotter reserve the right to cancel and/or amend promotional offers at any time. Offers cannot be exchanged for cash or used as a method of paying any outstanding customer debt. Offers are not redeemable at any independent shoe retailers who stock Hotter shoes. Style Chicks received the Beam Sandal by Hotter Casual Concepts in exchange for our unbiased review and received compensation for our time and effort. However, our experience with the product and the opinions expressed in this review are 100% ours. Posted by Style Chicks / Filed In: Accessories, Fashion, Shoes!